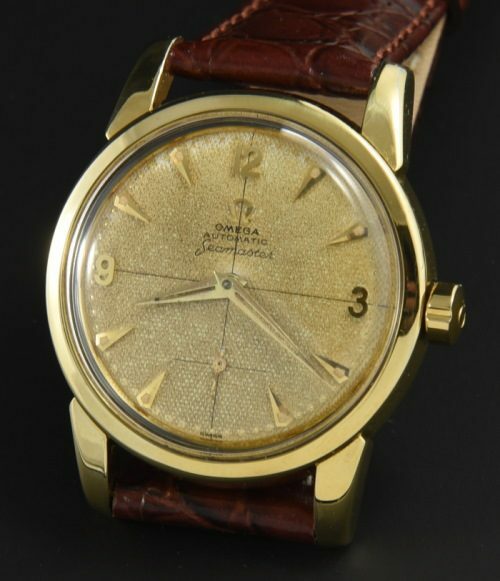 This 1957 OMEGA has a sparkling caliber 491 automatic (just cleaned) and accurate movement. The dial is quite striking-all original with amazing patina, honeycomb pattern, quadrant, 12, 3, 6, 9 configuration, sub-seconds, original Dauphine hands and uncommon dimple minute markers. The gold capped 34mm. case with steel back looks amazing. The OMEGA winding crown is correct. I love these “Havana” aged original dials! Most people refinish them. One day these dials will be VERY hard to find in original condition. just $1195.